A user asked about delegation of time approval today, so I figured I’d repost and update some information we first published over a year ago. This isn’t new functionality as this has been in place since we began self-service time approval in 2010. So you are a manager and will be heading on vacation, how do you handle time approval for your employees? While a manager can still access HR Direct and peform time approvals from anywhere in the world (with PC and network connection), there are times when it is necessary to have someone else do your approvals. Per design, managers can notmanually delegate their time approval responsibilities. 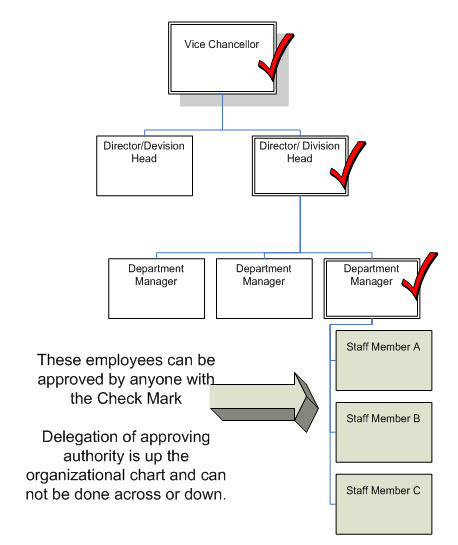 However, the system was designed with an automateddelegationprocess built in so all managers have someone else who can approve time for them if they are out of the office. At its simplest form, as a manager you also have manager — and that person can approve for you if you are going to be away from the office. So what do I need to do to get my manager the access to do approvals while I’m away? Allmanagers should already have access to HR Direct manager self-service. You should just have a conversation with your manager toarrange for them to do your approvals. Who do we contact if there are questions? Melissa Sullivan(x3538) is the Payroll Operations Manager and she can answer most questions on this. Additionally, Richard Conley (x4794)or Norma Clark (x4764) from the Administrative Systems office can assist.